The Texas TMS Center is an outpatient deep transcranial magnetic stimulation (Deep TMS) treatment facility. We provide Deep TMS therapy under the supervision of board certified general and geriatric psychiatrist, Jaron L. Winston, MD. Our center has over eight years experience offering TMS therapy to patients in Central Texas. Patients who are referred to us for Deep TMS, continue their ongoing relationships with referring clinicians throughout and after the completion of Deep TMS therapy. All decisions regarding medication management and treatment are made in conjunction with the referring physician or healthcare provider. In addition, referring clinicians receive weekly updates from Jaron L. Winston, M.D. on patient progress and are alerted immediately to any acute concerns. 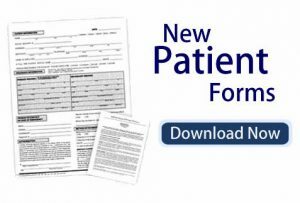 Upon completion of Deep TMS treatments, patients return for follow up care with their referring physician or healthcare provider. Why should I refer my patients for Deep TMS? Since 2009, our center has been providing transcranial magnetic stimulation to patients in our clinic. In addition, beginning in 2010, we began conducting clinical trials with Deep TMS in Dr. Winston’s research department, SASR. While Deep TMS was FDA approved in 2013 for major depressive disorder, we had the opportunity to provide Deep TMS treatments to patients within research protocols over the three previous years. To date, Dr. Winston has been a principal investigator on two multicenter trials for major depressive disorder, and two multi-center trials for Deep TMS and depression in bipolar disorder and smoking cessation. 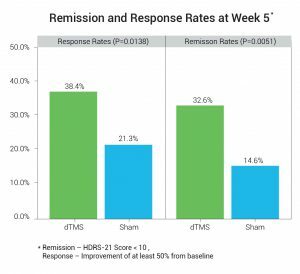 Our positive outcomes in the original research protocols on measures of depression, including the Hamilton Depression Rating Scale and CGI-S/CGI-I score, had a significant influence in our decision to offer Deep TMS in our treatment center. What are the benefits of Deep TMS for my patients with treatment resistant depression? Antidepressants, on top of their unsatisfactory response rates, entail systemic side effects leading many patients to neglect their medication regimes. Other alternatives, such as Electroconvulsive Therapy (ECT), require anesthesia and involve significant risks and side effects. Therefore, in many cases, patients with treatment resistant depression have been virtually trapped in their condition with no adequate solutions. Brainsway’s Deep TMS novel technology holds a variety of benefits for patients with depression. In addition to its noninvasive stimulation of deep brain regions 5,8 the treatment involves no hospitalization, requiring only brief 20-minute daily treatments over a period of 6-9 weeks. Additionally, a significant challenge for patients suffering from depression may include cognitive biases, social isolation and a need for behavioral activation. We have found that the structure of our Deep TMS program, requiring daily contact, cognitive skill building and feedback from our caring staff, in addition to the Deep TMS treatments, has a beneficial effect on patients with depression. In addition, for patients who are interested, we offer concurrent cognitive behavioral therapy for patients receiving Deep TMS. What other indications are being studied with Deep TMS? The Brainsway Deep TMS System is cleared by the Food and Drug Administration (FDA) for the treatment of depressive episodes in adult patients suffering from Major Depressive Disorder who failed to achieve satisfactory improvement with any number of antidepressants trials for the current episode of depression. The Brainsway Deep TMS system is patented by the United States National Institutes of Health (NIH). The FDA2 has granted Brainsway a wide indication for the treatment of Depression in all categories of patients who did not benefit from previous medication treatment. The FDA indication is based on a unique long-term 16-week Double-Blind Placebo-Controlled Multi- Center study which enrolled over 230 subjects, showing a profound decline in HDRS-21 and significant remission (32.6%) and response (38.4%) rates at the primary endpoint of the study. In the study, Brainsway treatment was proved to be safe, as the treatment was well tolerated by the majority of the study subjects with no severe adverse effects. In a large scale, multi-center trial, Deep TMS was shown to be a safe and effective treatment for patients who have been unable to tolerate two or more antidepressant medications2. For patients with co-occurring or remitted addiction, Deep TMS can be an appropriate solution. Patients with a history of chemical dependency may prefer and benefit from non-pharmacological treatments. Deep TMS is non-systemic, does not require the use of any anesthetics, and while many patients continue to take antidepressant medication during treatment, patients are not required to take medication to receive treatment. Research indicates that Deep TMS can be an effective smoking cessation treatment, and is currently being studied as a treatment for cocaine addiction. Depression is often a concern for women being treated for fertility issues. In addition, 10-15% of women experience postpartum depression within the first year after the birth of a child. In either case, practitioners and patients may have concerns about the effect of taking antidepressant medication on pregnancy or breastfeeding. Deep TMS is a non-invasive treatment that does not require sedation or any medication contraindicated during fertility treatment or breastfeeding. For new mothers, treatments are available at convenient times and take approximately 30 minutes a day. If you are considering referring a patient for Deep TMS and would like to review additional studies or academic journal articles on Deep TMS, please contact us at 512-610-1111. Would you like to refer a patient for Deep TMS Therapy? 1Rush AJ, Trivedi MH, Wisniewski SR, Nierenberg AA, Stewart JW, Warden D, et al. (2006): Acute and longer-term outcomes in depressed outpatients requiring one or several treatment steps: A STAR*D report. Am J Psychiatry 163:1905–1917. 3Grimm S, Beck, J, Schuepbach D, Hell D, Boesiger P, Bermpohl, F, Niehaus L, et. al. (2008): Imbalance between left and right dorsolateral prefrontal cortex in major depression is linked to negative emotional judgment: An fMRI study in severe major depression. Biol Psychiatry 63: 369-376. 4Becker G, Berg D, Lesch KP, Becker T (2001): Basal limbic system alteration in major depression: a hypothesis supported by transcranial sonography and MRI findings. International Journal of Neuropsychopharmacology 4:21-31. 5Levkovitz Y, Harel EV, Roth Y, Braw Y, Sheer A, Katz L, Gersner R, Zangen A. (2009) Deep transcranial magnetic stimulation of the prefrontal cortex: Effectiveness in major depression. Brain Stimulation 2: 188-200. 6Gersner R, Kravetz E, Feil J, Pell G, Zangen A (2011): Long-term effects of repetitive transcranial magnetic stimulation on markers of neuroplasticity: differential outcomes in anesthetized and awake animals. Journal of Neuroscience 20, 7521-7526. 7Kessler RC, Crum RM, Warner LA, Nelson CB, Schulenberg J, Anthony JC (1997). Lifetime co-occurrence of DSM-III-R alcohol abuse and dependence with other psychiatric disorders in the National Comorbidity Survey. Arch Gen Psychiatry 54:313-321. 8Roth Y, Amir A, Levkovitz Y, Zangen, A (2007). Three-dimensional distribution of the electric field induced in the brain by transcranial magnetic stimulation using figure-8 and deep H-Coils. Journal of Clinical Neuropsychology, 24: 31-38.